Thank you for checking out my first contribution! I’ve know Mike Dolbear for many years, and can say without hesitation that you couldn’t be in better hands when it comes to drum education. Thank you for the opportunity Mike – it’s great to be part of the team! My contributions are especially for beginner drummers. While I teach at all levels, I love working with beginners, because that means we are about to embark on an exciting adventure! So thank you for letting me be part of your adventure! 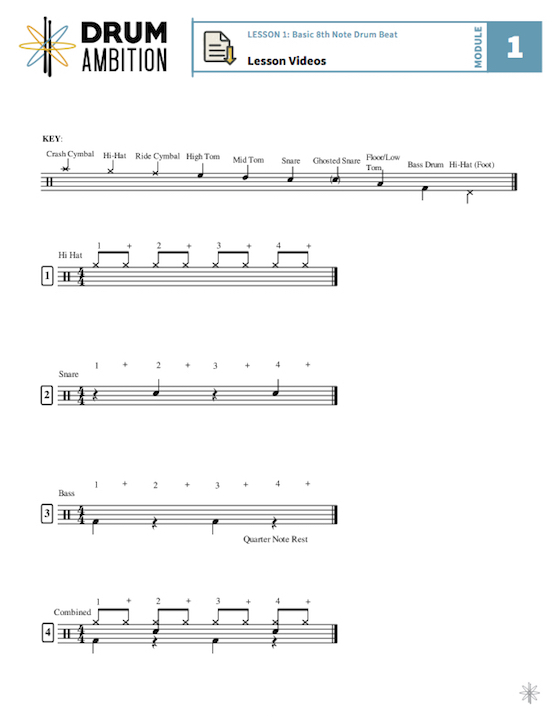 So, armed with the attached music notation, settle in for a 10 minute multi-angle video on putting your first drum beat together! This can be described as a basic pop/rock beat, but technically, it’s an 8th note groove. I’ll walk you step by step through the process, highlight some common barriers and how to overcome them, and set you on the road to effective practice. Have fun, play slowly, and don’t forget to count out loud! Please check out www.drumambition.com to see our full-service website. Thanks for checking in! Founder/San Diego Drum Lessons – A Mike Dolbear Affiliated Drum School.